It’s Monday once again, and I’m (once again) heading up to Wisconsin this week! This time it’s to celebrate the birthdays of my mom and my little niece (her first). I’m hoping to get to Devil’s Lake, Vitense putt putt, a beer at Weary Traveler, Jazz at Five, Cash Box Kings at the Terrace, and a bunch of other fun south-central Wisconsin stuff I haven’t had a chance to do in years. Should be a great trip! I’ve downloaded a couple of audiobooks (Mother. Wife. Sister. … by Rob Delaney, America (The Book) by Jon Stewart (miss you already)) for the drive, but I was a little befuddled by what to read on paper next. I did start The Girls of Atomic City by Denise Kiernan, but I’m not sure I want to bring that out of town (library book). So to round out that non-fiction, I chose to start An Untamed State by Roxane Gay as well over the weekend. So far I’m completely hooked… I’ll bring it along up north but figure I likely won’t have much time to read it! This entry was posted in activities, books, life and tagged book community, family, it's monday what are you reading, travel by kristin @ my little heart melodies. Bookmark the permalink. I gravitate towards dark subject matter and “difficult-to-read” books. I’m only 50-ish pages into An Untamed State and can’t stop thinking about it already. I love Roxane Gay’s work. I’m with you, dark subject matter is much more fun to read. Have fun in Wisconsin! I don’t think the weather is supposed to be too horrible until later in the week. An Untamed State is such a fantastic read. It hooked me right away, too, and ended up being the best book of the year for me. 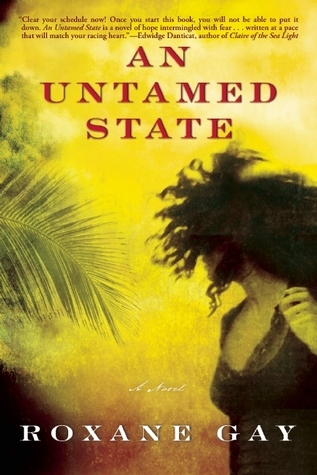 An Untamed State is definitely one that kept me reading! While it isn’t going to land on my favorites for the year, it was very readable. Hope it’s been a great week for you so far! I’m back from my trip to Wisconsin and so ready to dive back into it. Didn’t even spend one minute reading while I was up there!